We bought all new cotton candy machines for 2015! All of our new cotton candy machines rentals are now on carts. Having the cotton candy machine sitting on top of a cart looks a lot better than our older tabletop models. This new look just makes the party experience that much better for the kids. Our older models have pleased many customers throughout the Greater Milwaukee, WI Area and we have already gotten a lot of positive feedback on these amazing new cotton candy machines. Request a reservation for your cotton candy machine today. Our goal is to provide your family and party guests with a fun, safe party experience. Renting and serving your own cotton candy at your party will create memories that your family will remember for years to come. It is really easy to spin your own cotton candy. Our delivery team will show you how to use the machine when they drop it off at your party. 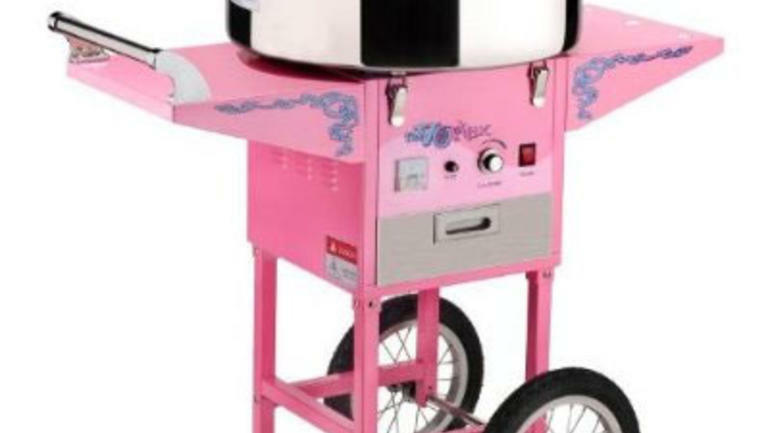 Like all of our concession rentals, we offer competitive prices for our cotton candy machine rentals. The cotton candy cart rents for $100/day. This rental package comes with enough sugar floss for 50 people with 50 cones for spinning. Additional servings available upon request for large events. We provide delivery and set up with all of our rental equipment up to 15 miles. There will be an additional charge for deliveries over 15 miles. Sell cotton candy at your next carnival, festival, or gatherings such as a school event or church get-together! Mouth watering cotton candy sells itself! You can always raise funds for your organization with our cotton candy machine rentals. Kids absolutely love cotton candy and it will be a hit for any church event, school fair or carnival. Check out our party rental packages for savings on the cotton candy machine when already renting other major rentals (Tent Rentals, Bounce House Rentals, or multiple concession rentals like a snow cone machine rental or Popcorn Marker Cart rental.